Courier services are something we take for granted every single day. With Amazon Prime able to handle shipping boxes to our doorstep in under 48 hours, we seem to just assume that quick delivery is the way things have always been. But have you ever stopped to consider the history of courier services? Where did this system originate, and how did it evolve into the massive economy it is today? In this article, we’ll go over the unique and fanciful history of how the human race gets items from Point A to Point B. If you couldn’t travel there by foot or by horse or donkey, you probably wouldn’t go. Thus, the likelihood that you’d need to send a message that far away was unlikely. Then the Gold Rush happened and things got (a little) more advanced. One of the earliest delivery methods was the pony express, which was built to connect the populated East Coast to the wild frontier of the West Coast. It was the first and earliest form of today’s more modern mail service. With hoards of people heading to California hoping to strike it rich, the nation had to find a way to connect the two very far sides of the United States. Business was to be conducted on both shores, and people needed to communicate despite the vast distance. Flyers advertising this early letter delivery service boasted that they could get a letter from New York to San Francisco in just 10 days. You’d drop off your mail before a certain cutoff time, then a delivery person on horseback would make sure your letter got to the other side of the country as quickly as possible. The pony express consisted of riders who were positioned all the way across the 2,000 miles from sea to shining sea. The way it worked was that riders would switch horses every 15-20 miles in order to accomplish the delivery as quickly as they could. The chain of riders operated across the entire country. Once the telegraph was invented and messages could be delivered with far greater speed, the popularity of the pony express declined. Eventually, with the development of the nation’s railroad systems, mail grew to be a bit faster and more efficient. Mail could be packed onto trains and make it to faraway places in a short amount of time. Usually, these items were safer along the journey because they were not exposed to the elements and did not have to sit under the care of just one horseback rider. Still, everything west of the Mississippi was considered to be the Wild West. Conditions were unpredictable, so you never really knew when your mail would arrive–if it got there at all. As times changed and human needs evolved, shipping methods grew more and more reliable and speedy. Is There a History of Shipping Boxes? This is another thing people usually don’t stop to consider. Have we always done things this way? What did we do before we could simply ship boxes to each other? The way things used to work is that all items had to be hand delivered. With no postal service to speak of, you had to hope you knew someone heading in the direction of wherever you wanted your delivery to go. There was no way to simply be shipping boxes around the world. You had to wrap up your parcels and entrust them to someone who would give you their word when it came to delivery. It would take days, if not weeks or months, before your items would arrive at their destination. And if you expect a reply? Well, that’ll be another few months. From letters to tangible goods, delivering things to recipients far away took as long as the trek there. Shipping boxes did not come around until delivery methods got more quick and reliable. People began to have a need to ship items back and forth across vast distances. No longer did people just need to send letters–instead, maybe they sent a scarf to their family member in California for Christmas. Or maybe they’d some souvenirs back home to their grandmother. Shipping boxes instead of just letters didn’t come around until people began to truly spread out and settle far from friends, family, and people they knew. Looking for Courier Services in the Modern Age? We sure have come a long way since the early days of item transportation and delivery. From carrier pigeons to shipping boxes using drones and robots, humankind has figured out a way to make very speedy deliveries anywhere on planet Earth. In today’s modern world, customers expect efficiency and reliability from all shipping services. You have to be able to trust that your shipping or courier service will deliver your item to its appropriate recipient, both safely and on time. 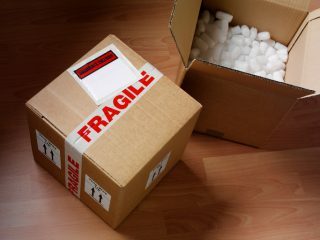 If you’re looking for courier services you can trust for shipping boxes, you’ve come to the right place. No matter if you need to ship refrigerated items or just send a package on a super rushed delivery schedule, please contact us today. We can provide you with a quote describing how long it will take to deliver your item and at what cost.